Ergon released their new downhill grips and saddle back in June, a slight detour for the brand whose roots of focus lay in road and cross country comfort and contact points. 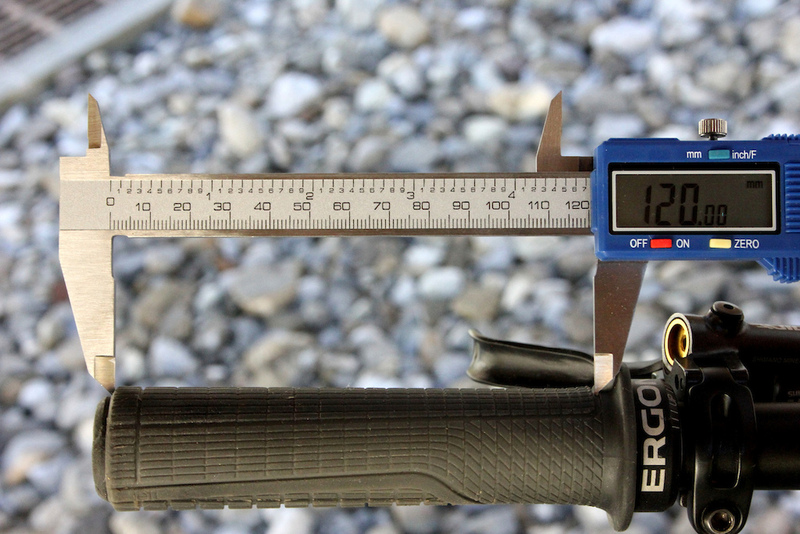 In conjunction with Tahnée Seagrave and Fabien Barel, Ergon has produced these downhill specific units and plenty of spiel to go along with them; I spent most of the summer testing these grips to find out if they could back up the bs. Fitting the grips is as easy as, well, fitting some grips, but with a couple of added features. The grips are side specific and are handily laser etched 'left' and 'right,' as well as having an 'Up' sign and markings for alignment. Another small attention to detail that works well is the tiny ridge at the end of the plastic core, when sliding the grip onto the bar there is a reassuring stop when it's all the way on. A single 3mm Allen wrench is used on the inboard metal locking clamp and the core runs the full length of the grip with two small cutouts at the outer edge. The GD1 has a slightly tight fit on the bar which gives a solid feeling with no twisting. The locking collars are etched to show the correct side and orientation. A small ridge at the end of the plastic core lets you know when the grip is in the correct position. 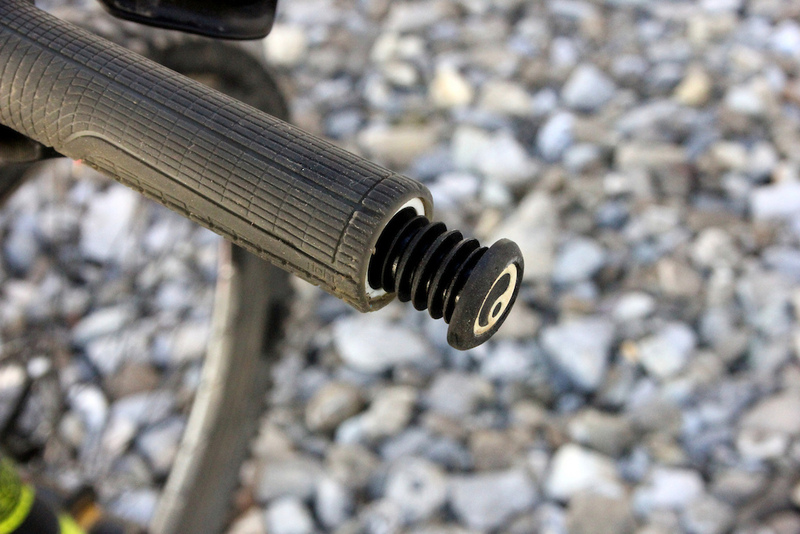 The GD1 grips come with long bar end plugs that should survive the worst crashes. If not replacements are available separately. I'm a thin grip kind of guy and chose the 'slim' version to test. The grips are slightly tapered from 29mm to 31mm at the outer edge. Ergon says this is designed for a narrow feeling at the thumb and wider towards the outside to give more padding under the palm of the hand. The main benefit I found from the taper was that after acclimatizing to the grips, I could always feel exactly when my hand was in the correct position. The overall length of the grip including the end plug is 144mm, the usable area is around 120mm. This could cause problems for riders with small hands who need to position the brake lever close to the grip. I generally run my levers a long way inboard of the grips, but with the Saint levers on my test bike, there were only a few millimeters of leftover space between the two clamps. These angled blocks should help to 'hook' your fingers to aid grip when pulling up on the bar. As mentioned above, the grip feels stiff and precise, but still absorb vibrations well. Partially due to the numerous shallow cuts and sipes in the rubber which dissipates vibrations but does not allow too much flex or wallow. Ergon say they have formulated the compound to be soft but with a fast rebound, as rubber that is too soft can cause a 'swimming' feeling; either the marketing spiel got to me or it's true. 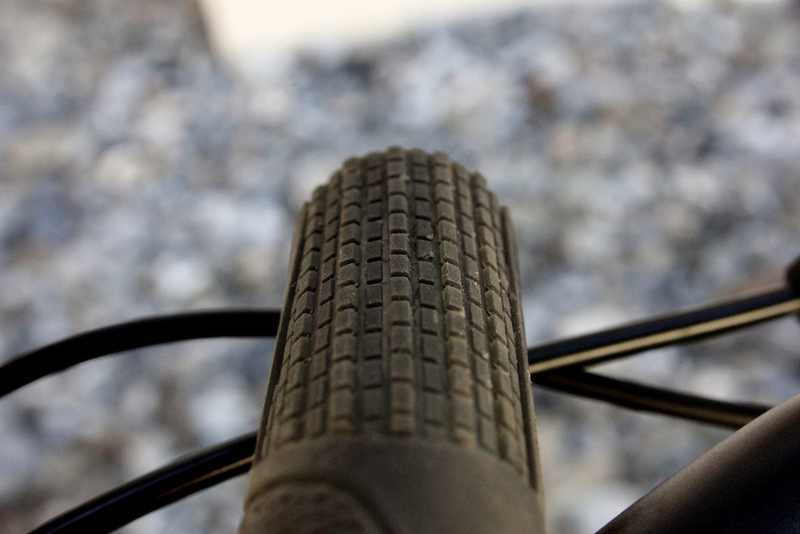 The rubber compound also appears to be durable and has lasted 25-30 days of downhill riding with hardly any visible wear. The cuts and sipes should also help in muddy conditions, but after plenty of time falling off in the mud this summer, I found they are not really profound enough to make any real difference against a muddy glove. Can't believe I just used some of my lunch break to read about grips. What's wrong with me? I'm reading this while I'm in my work. The things you can read are boundless. It's not like I'm ever going to buy these grips specifically, nor would it affect me if I didn't care about them whatsoever, but in my soul I'm just overwhelmed that somebody somewhere was able to experience them. Same with the next lint I find, expect a full review, and critical in depth analysis. Just wanted to inform people I got these grips today and the fit is too tight for any of my bikes. I'm sure there's some fraction of a millimeter that the finish on bars have and you need to account for that with these grips. The GA2 is a favorite of mine and those fit, snugly, but not so much so I can't even install them. So note you may not be able to use these grips and I can't tell you what will determine that or not because without some precision micrometer, you may not know for sure. These are probably the tightest fitting single clamp grips on the market and I'd say there's a decent chance they will not fit easily and may not fit at all. Let's talk about these crazy high prices, we can't let this topic SLIP away. While I have tried them and I work for the local distribuitor (so I get good pricing) I still went with Ergon's GE1 and they feel completely different than any other grip I have tried. Ergon have really locked on to what the market wants. Gripping stuff. I'll get my coat. @rc3kartusa: I agree, the industry should really Grasp the immensity of this problem. I love Ergon grips, my hands never did get used to regular round grips, too much pressure in the wrong spots made them painful to use. But they've been making "enduro" and trail grips for years now, not sure why Paul considers this a departure from the brand's focus? Richie Rude has been rocking ergon grips for a while, -'d I'm pretty sure he's not known for his XC riding. I'm using the Ergon GA2 on my DH bike and i'm really satisfied. You can actually feel the tapered shape as Paul said above, what makes these grips really comfortable. As soon as my GA2s are done, i give those GD1s a try. running the ga2 for dh, awesome grips! Nice feeling, rubber compound is very sticky and it lasts quite well. It helps with hand fatigue. Totally recommend them! "Colour: Frozen Black" - WTF?! Moto/atv grips make these expensive mountain bike grips seem silly and uncomfortable. I'm never going back. Do they fit also on e bikes ? I prefer more bulge in the palm of my hand. I'm using Squarwave XLs and they're incredibly comfortable with a bulge. The GE-1s kinda give that. additionally, they have a "window" in the core that allows the rubber to go all the way down to bar, near where the outside of your hand goes: this is the best feature I've ever run into with a lockon. I'm hoping they don't go away from it, as they did between the GA-1 & GA-2. I also can't tell from the article if the GD-1s have this feature or not. If they go away from it in the GEs, I might actually give up on lockons & go back to slip-ons for the first time in 20 years: that window of rubber reminded me how much more comfortable grips are when the rubber goes all the way to the bar. @src248: that's my current favorite grip! @groghunter: The GE1 and GE1 Slim are the only grip model that have the window in the core of the grip. The current GA2 and new GD1 Factory and GE1 Factory do not have this window. The GD1 Factory and GE1 Factory, both new for 2017, utilize our new Factory rubber which because of it's rebound properties and softness takes away the need for the window in the core. @ergonbike: Bummer. I've used pretty much every grip on the market, & ones that either have that window, or a flexible core, are worlds above, feel-wise, a rigid core grip. I'll take a look at this new rubber, but I'm skeptical. Push on Renthals are also my fave. Damn now I'm gonna have to try these. Agreed. Once you try push on Renthals, everything else doesn't feel so great. Renthal grips are by far the worst grips I've ever owned. I've never really cared about grips ill just ride whatever but I hated those grips and I know its just personal preference but those renthal grips were inexcusable. @thenotoriousmic: you're gonna have to elaborate dude. I've had the push ons and a few of the lock ons and they've all been sweet. What was the problem? Never got a chance to get them feeling sweet because they tear so easily mine only lasted three weeks, wouldn't stay on the bar, constant throttle grip and they were super uncomfortable. I'm not fussy about grips at all. As long as they don't have a lock on collar by the bar end ill ride them but these grips are useless. 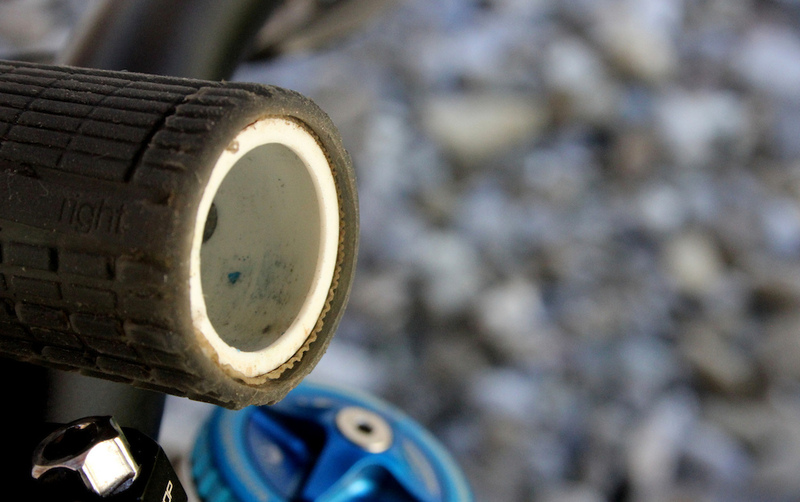 Not sure why again Pinkbike spend lots of time reviewing a product and doesn't do a shootout. ODI Elites no better grip out right now. How do they compare comfortwise to the GE1 Factory?! Do these extend out past the end of the bars as some other models do? I've read that some of Ergon's grips actually increase the width by 10-15mm. I don't have them with me right now, but I would guess these grips only add an extra 2mm each side maximum and another 2mm for the end plugs – similar to most normal grips. 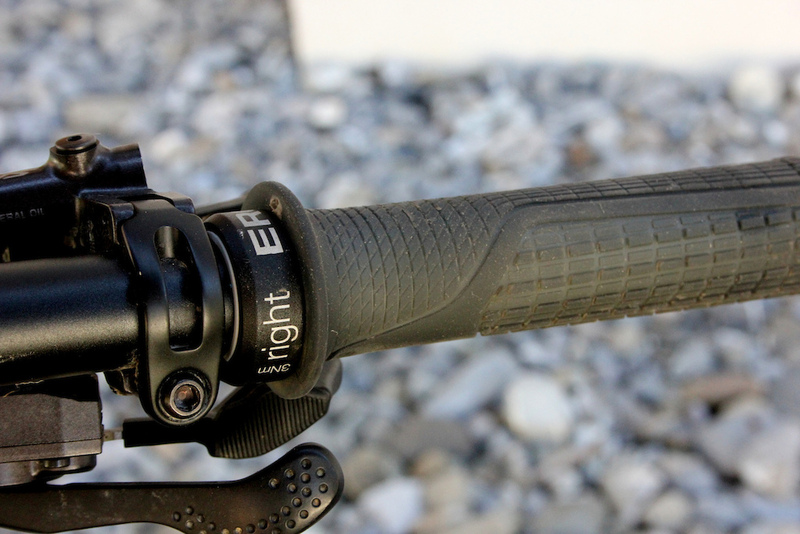 You are correct about other Ergon grips like the GE1 enduro grip, which has angled ends and can add a lot more width. 10-15mm is extremely exaggerated. All our grips have an auto-stop at the end of the grip. Installed correctly, you may get 1-2mm of grip extending beyond the end of the handle bar. The GE1 series does have a flare at the end of the grip, but it is not adding much length beyond the end of the handle bar. 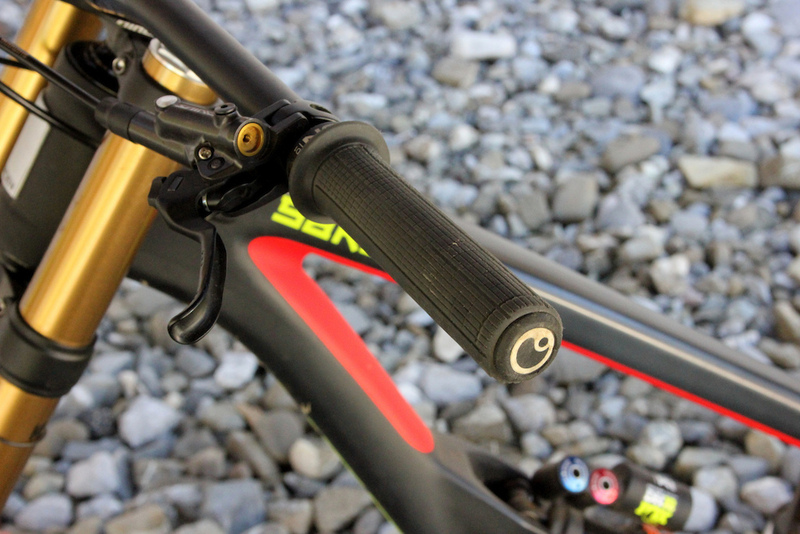 @ergonbike: although this would be a great idea as we could manage different bar width by switching grips. I'm digging the WTB Padloc grips on my trail bike. Going to put them on my DH bike too. The WTBs might not be for everybody, but most riders would enjoy them. Will i cut my bars in a strange angle so i can use no other grips in the future without knowing if i like the Padlocks? For sure i will, no brainer! And I see they are pretty expensive, too. Good for my reputation amongst my broke ODI-using friends. Perfect!